What will Michelle Obama wear to tonight's State Dinner? It's quite possibly the hottest ticket and is headlined by Jennifer Hudson, but yet it is a gathering of some of the most powerful congressmen, diplomats, and this year's honored guest, India's Prime Minister. So can Michelle go fashion forward or stay conservative? "The clothes can't be too fanciful, too fashiony, too anything. They should be appropriate and festive, like what you'd wear to an extremely expensive, ultra-formal wedding." I took a few minutes to sift through some Spring shows and find a dress that maybe could work well with the dinner set up. 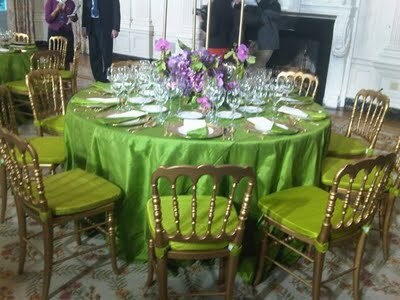 Here's a pick via Huffington Post of the table settings and colors. 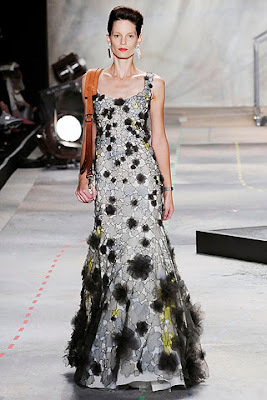 Wouldn't she look amazing in this Isaac Mizrahi dress? There are hints of the yellow/green color in the dress, but very fashion-y. 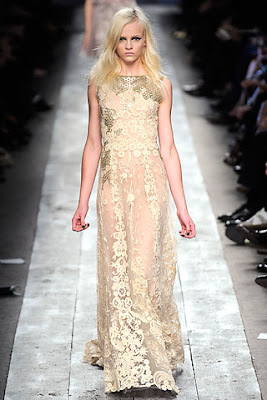 Or maybe this Valentino gold lace dress to show off her arms and highlight the gold chairs and plates. It is a bit more conservative as well. Or perhaps Michelle will go for something more simple and less fashion forward and custom designed from one her favorites like Jason Wu. Maybe just a simple cut dress with a pop of color in a conservative fabric.